Often times, we find that a lot of men who are searching for the perfect wedding band are torn on what they truly want. They are enamored with the overall contemporary look and strength of a titanium ring, but believe that a wedding ring should at least incorporate one of the more traditionally used metals, such as gold, silver or platinum. It’s a tough decision to make but as time ticks down closer to the day of the wedding, now is the time to choose. But what if you didn’t have to? 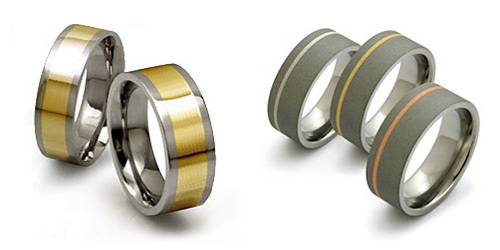 At Avant Garde Jewelry, we have the ability to create custom inlaid titanium rings for grooms-to-be. 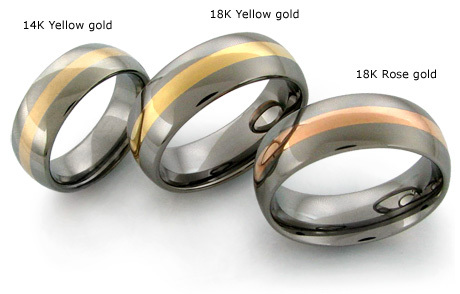 What this means is that we can actually create a very unique type of ring that combines titanium with your choice of gold, platinum or silver metal. Because these traditional metals are much softer than the titanium, the inlaying process is actually pretty easy for us and leaves you with a gorgeous ring unlike any other. Not only will you have the opportunity to choose which precious metals you would prefer to pair together, but you will also be able to request just how wide you would like the accent inlay to be. Regardless of whether you decide that platinum, silver, or yellow, white or rose gold is best for you, we can make that line as thin or as wide as you would like. How do we do this? Through a process referred to as “damascening”. Originating in Japan many, many years ago, this particular technique was initially used to decorate katana fittings, such as the tsuba and can be used to produce intricate patterns similar to niello. Though it has grown to develop its own subset of terms when it comes to describing various patterns, damascened-inlay jewelry can sometimes be referred to as shakudo due to its use of alloy as the dark background. However, here at Avant Garde Jewelry, where our rings are handcrafted using titanium, we simply refer to the process as inlaying and do our best to deliver the very best wedding bands to our clients. Your wedding should be all about what you want without exception and we want to ensure that you are 100 percent happy with the ring that you will inevitably be wearing every day for the rest of your life – and sometimes that means not settling on just one precious metal. We understand this and we want to help. Let us create the perfect custom inlaid ring for you. Take a look at all of your options and feel free to contact Avant Garde Jewelry today to get started!